Made in USA by Mattel, introduced in 1947. The Uke-a-doodle was the first in a long line of toy instruments for Mattel. Interestingly, Mattel released the Uke-a-doodle two months before the New York City Toy Fair, and consequently at the fair, other companies not only were copying the idea, but some were actually using Mattel's product as samples. The Uke a doodle was part of Mattel's "Futureland" line of Toys. 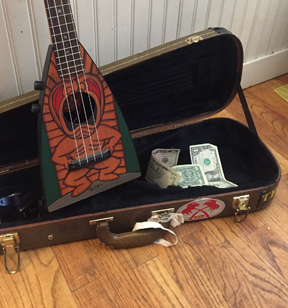 Not to be confused with the "Uku-doodle", made in Australia by Liberty Plastics for "The New World Musical Company"
Back to the Tiki King Ukulele homepage!